♂ Observed at Nairobi National Park, Kenya. Dec. 2014. 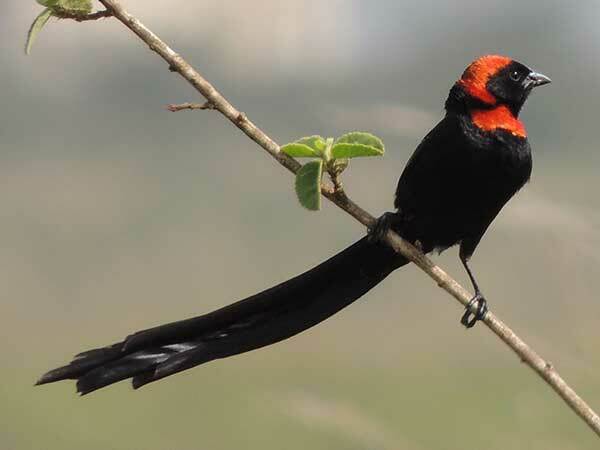 From Wikipedia: Similar to other widowbirds, male red-collared widowbirds have both seasonal and sexual dimorphism. Males are larger and heavier than females During non-breeding seasons, the male plumage is brown, while in breeding season, October to April, they have black plumage with a long tail, approximately 22 cm, and crescent–shaped carotenoid based chest patch. There is significant variation in brightness, hue, and chroma of the carotenoid badges. In contrast, females and subadults, like nonbreeding males, are streaky dull brown with a short tail, approximately 4 cm. Nonbreeding males, however, retain their black tails, while females and subadults' tails are dark-brown. Copyright Michael J. Plagens, page created 12 Aug. 2015.